I spent a few hours last night playing the Halo: Reach multi-player beta. (Microsoft sent out a few early invites to writing-guys like me, but the beta opens to Halo: ODST owners today.) It’s been a while since I’ve played a Halo game for any real amount of time. I dabbled with Halo 3‘s multi-player for a little while there, but that was two years ago. 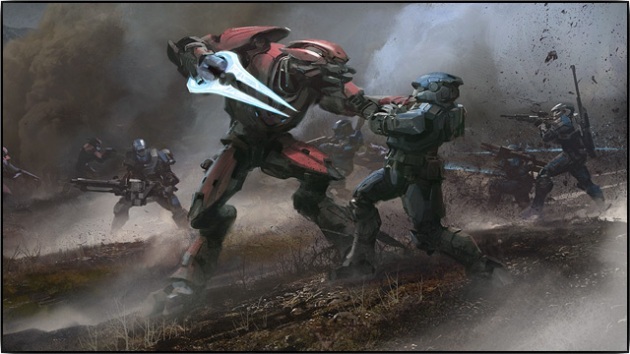 First impression of the Reach beta: absence makes the heart grow fonder. CrunchGear: your home for old man idioms. Even though it’s been two years since I spent any amount of time in the Halo universe, I felt as if I had never left. That’s how Halo it is, if that makes any sense. You jump in, you have that same damn gun you always have, and off you go. But there are changes. Depending on the mode you select, you’re given access to one of several different abilities that are class-dependent. One class has access to invisibility (you tap the Left Bumper and you’re briefly invisible), another has access to being able to sprint (handy if you’re running toward a flag that needs to be captured, but you can’t sprint with the flag). Probably the “coolest” ability, I guess, is the jetpack. You tap the Left Bumper, and you’re floating away like Elroy Jetson. It’s pretty Tribes-like. At the end of each game, you’re awarded a certain number of points (yes, à la Modern Warfare), points that can then be used to buy armor upgrades and the like. Right now there’s only two maps, but apparently Bungie will add another one as the beta goes on. I’m thoroughly sick of both maps already. You know how you can play 2Fort in Team Fortress 2 literally hundreds and hundreds of times in a row? I don’t know if the two maps that are currently on offer have that same replayability there. So far, I’m not seeing the same kind of rock-paper-scissors-ness to the game. Like in Team Fortress 2, you can have an Engineer set up a bunch of sentries near your briefcase, but then the other team has a Spy who can sneak in while invisible, then deactivate said sentry. Team Fortress 2 seems so layered, almost like a chess match. I don’t quite have that sense yet in Halo Reach. On the other hand, I’d much rather play something like Halo multi-player than something that’s pretending to be real, like Modern Warfare 2. Then again, this is merely a beta, and it’s a pretty fun one at that. That’s all you can ask for, really. SLIGHT UPDATE So the game’s servers are getting hammered right now. Don’t be surprised if you’re waiting in the lobby for a little while.